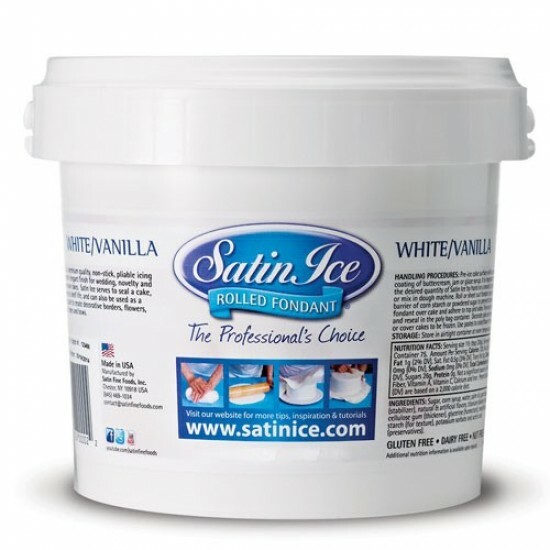 Some of the world's renowned cake designers and sugar artists call Satin Ice their brand of choice for rolled fondant and gum paste. Satin products can be seen on a multitude of cable and satellite TV food shows such as "Ace of Cakes" (Food Network), "Cake Boss" (TLC), "Food Network Challenge", "Ultimate Cake Challenge" (TLC) and more. The finest cake shops, bakeries and patisseries use Satin Ice products to complete their works of edible art . . . from birthday, wedding and special event and novelty cakes to cupcakes and cookies or as stand-alone sugar figurine displays. Our signature flavor is unmatched: Mellow, Smooth & Creamy . . . NEVER chewy. Our chocolate fondant, with its "Tootsie aroma" and flavor, is a favorite. When modeling decorations, your pieces will dry just as you intended. Satin Ice will not overdry and crack. Seals the cake, keeping it moist and fresh and increasing the shelf life of the cake. Your finished cake may be refrigerated or frozen once covered. Chocit Modelling Chocolate - White150gA great alternative to fondant or gumpaste. Pre-coloured, easy to use and great tasting.Figures ..
Chocit Modelling Icing - White500g packAn alternative to fondant or gum paste. Easy to use and tastes great.Chocit can be coloured using gel..
Over the Top Edible Glue An edible glue used to secure decorations onto cakes, in the construction of sugar flowers or as a sticky surface for ed..
Silver covered cake board - 12" round9mm thick, masonite..
Vizyon White Gum Paste Vizyon gum paste is a ready to use modelling paste, suitable for making flowers, figures and other decorative features.Dries qu..